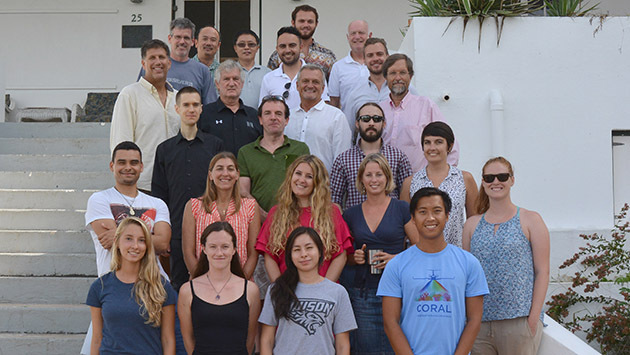 Over two days in late August, a team of nearly 30 scientists, engineers, technicians and project managers met at BIOS to plan their approach for the next phase of the three-year COral Reef Airborne Laboratory (CORAL) project. The mission, funded by NASA, aims to provide critical data and new models needed to analyze the status of coral reefs around the world and predict their future. The key to collecting these data is a unique instrument called PRISM—the Portable Remote Imaging Spectrometer—designed by NASA’s Jet Propulsion Laboratory to survey coastal environments from the air. The PRISM instrument carefully measures the intensities of different colors of light—or spectra—that identify different components of the seafloor: coral, algae, or sand. However, in order to obtain these spectra, CORAL scientists must apply a series of corrections to account for factors that influence how light travels from the seafloor to the instrument (located in the belly of an airplane), such as the atmosphere, the sea surface, and the water column. Additional data are collected by in-water validation teams to help CORAL scientists develop more accurate correction algorithms, as well as inform models of reef ecosystem function. With fieldwork having been completed this past spring, project investigators are now turning their attention to the terabytes of data collected from airborne and in-water field campaigns in Australia, Hawaii, Palau and the Marianas, and Florida. For the next year, the team will process all of the PRISM imagery and combine the in-situ (or in-water) data into formats that are easily modeled to help shed light on the relationship between reef condition and a variety of biological, geological, and physical factors, such as water temperature, primary production, and light condition. This result—a set of quantitative, empirical models that can be used to estimate current reef condition and forecast future reef condition under scenarios of predicted global climate change—will be useful to both scientists and resource managers in their efforts to steward these vital ecosystems.